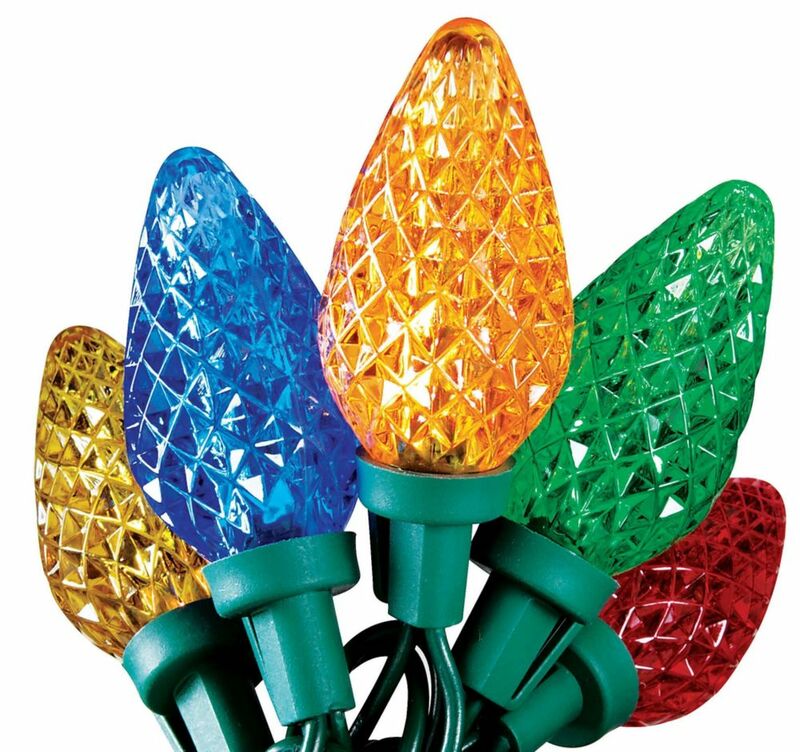 Decorate your holidays with affordable, power saving and attractive LED Lighting. LED Lights offer Extra Long Life and use up to 80% Less Energy than Standard Bulbs. Super Bright LED C9 25L Multi Decorate your holidays with affordable, power saving and attractive LED Lighting. LED Lights offer Extra Long Life and use up to 80% Less Energy than Standard Bulbs. They are cUL Listed and can be connected to more sets than Standard Lights. Super Bright LED C9 25L Multi is rated 1.0 out of 5 by 5. Rated 1 out of 5 by GB Vic from These are TEMPORARY lights only Bought many boxes of these lights last year, and went to put them up this year. NONE of them work. After plugging them all in, and wiggling bulbs to see if there were any loose ones, I happened to read the label. Instead of the typical voltage and caution notes, it says: "For temporary (90 days max) installation and use only." Seriously? Would anyone buy them if they knew they were temporary lights? Rated 1 out of 5 by Hoop35 from Stay away from these lights Bought 3 strings of these lights last year. They all worked great last year, and this year went to put them up and not one of these strings worked. Checked the 2 little fuses in the plug in to see if they were okay and then the instructions suggest I go through each and every light to see if that's the problem. Did it for one string and they still didn't work. I am not going to waste my time with the other 2. Would not suggest these lights to anyone....I have others that have worked for years, 1 year and that's it for these .... get others. Rated 1 out of 5 by Karen Bennie from C9 bulbs....awful I made the switch to LED’S approx 5 to 6 years ago... all purchased from Home Depot. It cost my husband and I close to $ 850.00. They have been a nightmare.. every year since I have had to return at least 10 sets. This involves us driving for 1 hour to our nearest Home Depot. Up until this year Home Depot has been great about exchanging them as they have a 3 year warranty but this year. Customer service gave us quite the time .. they weren’t going to she said you will have to go through the manufacture. But another girl came along and said just exchange them. We got those home and some did not work and we had to go on line and order another 10 sets... we barely have enough for our house. We use 45 sets to complete our display. Unless something changes with theses lights I will never purchase them again. I am sure when we go to use them this coming Christmas ... more will not work. I want to mention my husband is very careful with our lights he winds them up stores them carefully in a tote in our garage which is heated. Feel free to check history on both my husband and mine h9me Depot credit card to see how many sets we have purchased over the past 5 years. Rated 1 out of 5 by Toja from Very, very bad product. Lights work only two days! Lost of time and money. Rated 1 out of 5 by VASTOR64 from NOT RECOMMENED - LED C9 XMAS LIGHTS DO NOT BUY THESE LIGHTS WITHOUT TRYING THEM FIRST IN-STORE TO MAKE SURE THEY ARE WORKING. LED IDEA GOOD; EXECUTION QUESTIONABLE. THESE LED LIGHTS APPEAR TO BE AN LED VARIATION OF THE OLD "MINI LIGHTS" THAT I THINK DROVE MOST PEOPLE NUTS WITH BULB FAILURES ETC. THE LIGHTS HAVE A PLASTIC COLORED SCREW OFF COVER WITH REPLACEABLE LED 'BULB" INSIDE. THE LIGHT STRINGS ALSO INCORPORATE FUSE SYSTEM SEATED IN THE MALE PLUG END; THE INSTRUCTIONS SAY TO REPLACE THE FUSE IF THE STRING DOESNT WORK. THERE ARE ACTUALLY TWO FUSES. THEY ARE VERY SMALL; I HAD TO USE TWEEZERS TO GET THEM OUT AND A MAGNIFYING GLASS TO SEE IF ONE OR BOTH WERE BLOWN; COULDNT REALLY TELL. TRIED REPLACING BOTH FUSES WITH ONES SUPPLIED IN BOX. DIDNT WORK. TRIED GOING THROUGH STRING LIGHT BY LIGHT RE-SEATING THE LED BULBS; DIDNT WORK. REPACKAGED FOR RETURN. I BOUGHT TWO SETS OF THESE; ONCE INSTALLED ONE WORKED; ONE DIDNT. ON PRINCIPLE, I DONT RECOMMEND THESE. WHY? 1) LED IDEA GOOD 2) REPACKAGING THE LED AS A REPLACEABLE BULB WITH THE WIRE CONTACTS IS A BAD VARIATION OF THE OLD "MINI LIGHT' STRING IDEA; MORE CONTACTS MORE PROBABLILITY OF FAILURE. MAKE THE CONTACTS / CONNECTIONS PERMANENT AT THE FACTORY. CHECK TO MAKE SURE IT WORKS THERE. 3) MANUFACTURING PRODUCT IN THIS WAY WASTES FACTORY / MANUFACTURING, SHIPPING, RETAIL, CONSUMERS TIME AND RESOURCES. YOU'RE ASKING THE CONSUMER TO USE HIS TIME TO FIX OR DEAL WITH YOUR MANUFACTURING SHORTCOMINGS. DONT PUT DINKY LITTLE FUSES IN THE STRING; USELESS IDEA FOR A $9.00 LIGHT STRING. FUSES ARE WAY TO SMALL TO HANDLE OR SEE AND YOU CERTAINLY WOULNDT WANT TO TRY DEALING WITH THESE UP ON A LADDER ONCE LIGHTS ARE INSTALLED. TEST THESE IN-STORE BEFORE PURCHASING. TEST THEM AGAIN BEFORE PUTTING THEM UP.